Cancun – After a quick breakfast at the hotel, we went for a wander to look at the markets and the Plaza del Toro where the bullring was. Although it was getting on for 10 am the market stalls were only just starting to open, so we had a quick browse but didn’t find anything appealing at this stage. The walk down to the bullring crossed a few very busy roads with traffic all seemingly fairly orderly although quite busy. The bullring looked vaguely familiar as we approached it as Jeff and I had actually gone to see a bullfight back in 2000 when we were last here. 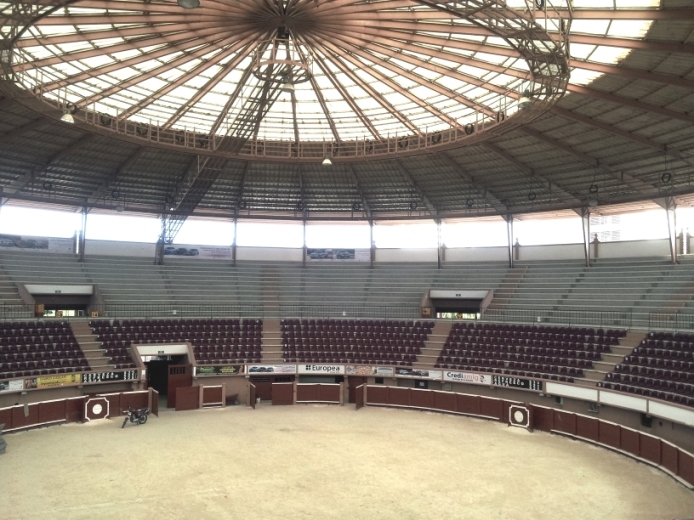 We didn’t remember it being a closed roof ring back then, but these days it seems they use it for a lot of events and performances – perhaps the bullfights are not held too often now. We climbed to the second level to see if we could get a glimpse inside and were very lucky to find one of the doors open as workmen were carrying out some repairs. They didn’t seem to mind that we stepped inside to get a quick photo. From here it was back to the hotel making a circuit around the block, stopping for a quesadilla along the way ready for our 12 pm shuttle pick up. The shuttle was 20 minutes late when we asked reception to call them for us. There was a problem apparently because we booked less than 24 hours in advance (their people did not mention this at the airport when they took our money). The call centre guy said that we could take a taxi and then get a full refund for the shuttle at the airport, or he could send a shuttle but it would be another 20 minutes. We didn’t want to be any later getting to the airport so we opted to take a taxi and try and get a refund. 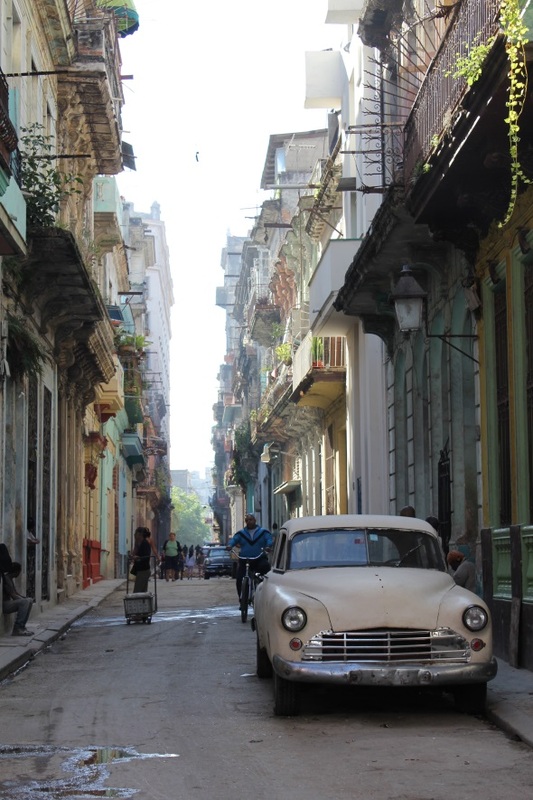 Once at the airport, we wanted to get checked in for our flight to Havana as we had to organise our Visas and there were crowds of people at all counters so we wanted to join the line as quickly as we could. As it turned out, there was no need to go to the Cubana Air office for the Visa, there was a man in the check-in queue who was writing the Visas as we waited in line. We wondered how this was all going to work before leaving Australia, but it was so laid back and casual, we needn’t have had any concerns. Once the Visas were completed, we just paid him the US$25 or 250 Pesos and proceeded in the check-in queue. 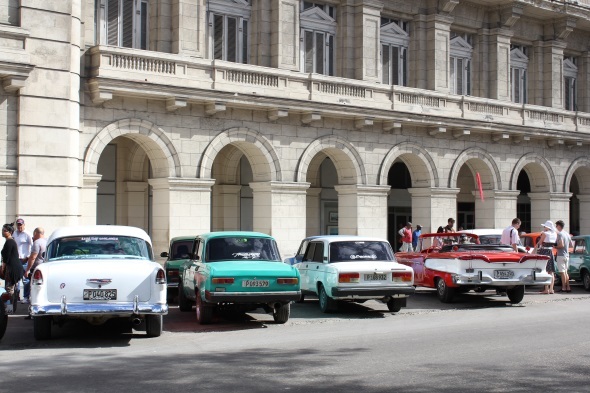 We had realised that morning, that we didn’t have a print out of the Cubana Air tickets so we hoped we could check in without our itinerary – and we could, all that was needed was our passports making this whole process so straightforward. Then we decided to try and get our refund for the shuttle, and after a bit of asking around as to where the company were located at this terminal, this proved pretty straightforward as well. So, with refund complete we went through to departures, expecting quite a delayed process but were pleasantly surprised as it was just a passport and boarding pass check and we were on our way. The Cuban flight all went smoothly and coming in to land there were views across the island of very green farmland woven like a patchwork with different crops and vegetation. The airport was a lot more modern looking than we would have expected both outside and in the terminal, and so much busier than we had anticipated. There were a number of flights that had just landed around the same time as ours from London. Paris, Moscow and Canada as well as ours from Cancun. This made for an extremely busy immigration area and a very long wait for us all to get through. We spent over two hours in the immigration line, with the officers processing people one at a time, no family groups or couples together. The officer we had spent a long time looking at our passport stamps, then asked if we had been to Africa (we had last year) and wanted to know if we had been to any of the Ebola-affected countries (we had not) and did we only have one passport (so we weren’t lying about the African countries visited). Once we were through immigration the baggage collection and exiting was relatively painless, although we had a bit of a wait for our three suitcases to make it onto the carousel – surprising they weren’t already there as we had been off the plane for more than two hours! 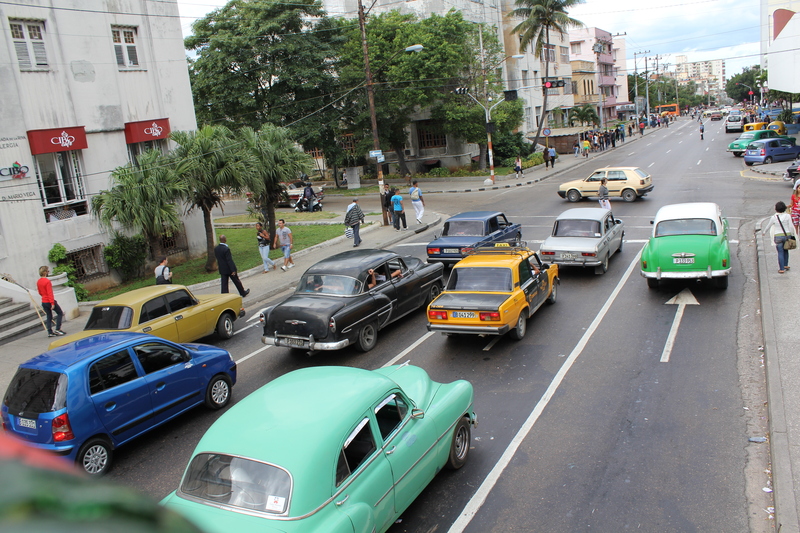 It was then on to getting money changed and a taxi to our reserved Casa in Havana. The arrivals area was teaming with people, with both ends having entry doors which had large crowds eagerly awaiting the passenger arrivals. There were no clear signs as to where a money change place was located, so Jeff went scouring the terminal, eventually locating an office outside. Whilst he change our English Pounds and Euros into Cuban CUC’s, the kids and I waited with the bags and asked at the information and tour desk about getting a taxi and the approximate cost. The lady at the tour desk said she could call and book a taxi for us whilst the lady at the information desk said we could get one out the front of the terminal. Both advised the cost should be 25 CUC, which was handy to know as when we walked out the front, the taxi driver quoted 30 CUC and we could barter down to 25 CUC as that is what they quoted inside. He accepted that and then we gave him the 5 CUC extra as a tip at the end of the journey. We thought that we would be getting in an old style taxi but were surprised to see a lot of modern looking official yellow and black taxis as we left the terminal. There were a few old style vehicles there and quite a few old Russian Lada cars operating as taxis, but definitely, the more modern taxis dominated which we hadn’t expected. Our taxi was one of the official yellow and black vehicles. No metre was used as we had agreed on the price before departing. 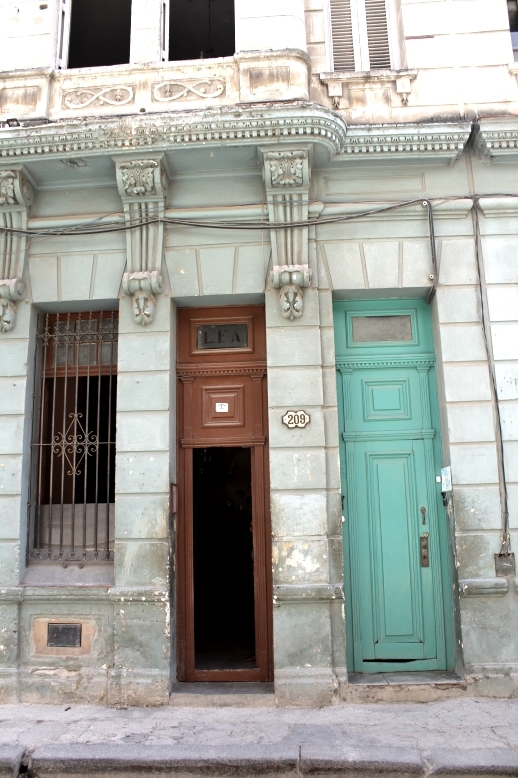 Our Casa in the centre of Old Havana was found easily by the taxi driver and there was no haggling over the cost of the journey. Our driver pointed out a few sites as we passed in the dark and with our limited Spanish we managed to pick up a few things he was saying. The roads from the airport to the Old town were all in very good condition, with most being two or three-lane freeway-style and the traffic was very light for the whole journey and drivers were very orderly. There was a sign in the doorway for the Casa we had booked and when the lady answered there was a little confusion as she didn’t seem to have our reservation, but once she looked at the emails we had with us, she realised we were at their other location, next door! Once she had buzzed the intercom, we were met at the door by Emilio – the lady who we had been emailing. 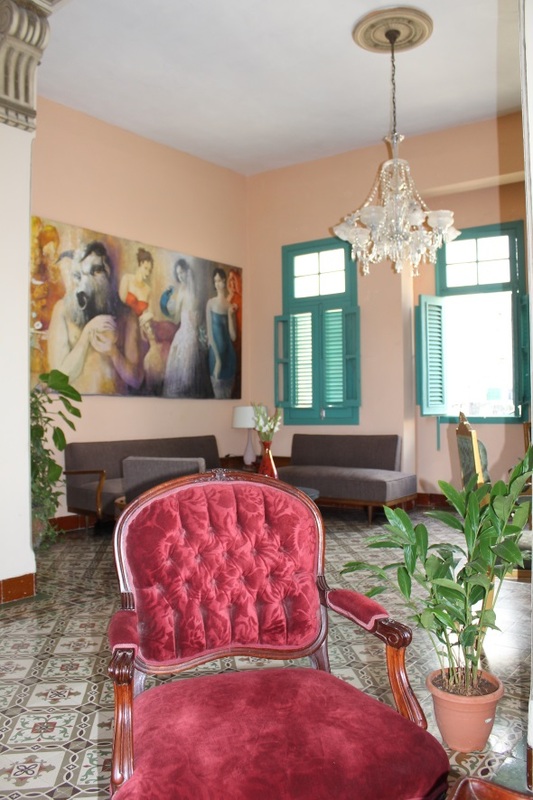 After a very steep climb up a long and narrow marble staircase we entered a very chic open sitting area oozing old world charm with antique furniture, mirrors and very modernist artwork adorning the walls. The high ceilings with ornate plasterwork really added to the sense of grandeur. 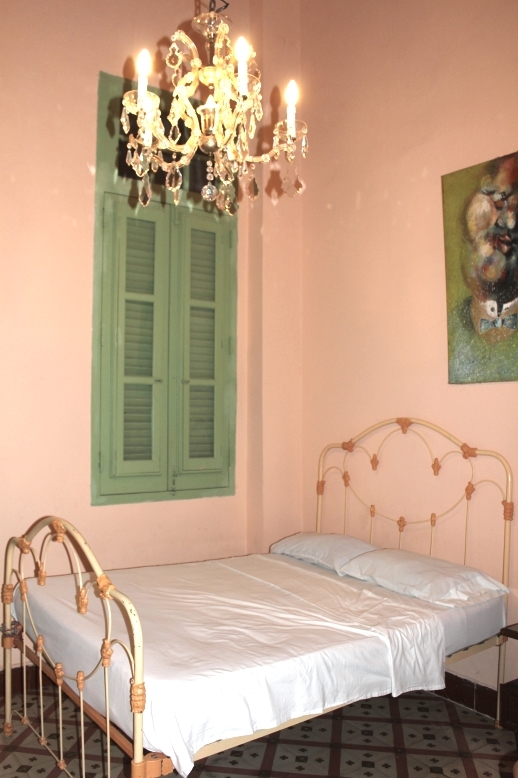 We were shown to our rooms, one right next to the sitting room with a double bed and the other two rooms away with two single beds. Both had an ensuite, albeit very basic, but they were very clean and comfortable with hints of the sitting room old world charm, such as elaborate chandeliers as the main room light. We were given a quick tour of the casa and shown the kitchen for breakfast the next morning. We had ordered a dinner for our first night as this was an option and we figured we would be arriving a little late – this seemed to have got lost in translation and it was too late for them to prepare something for us. This actually worked in our favour, as we were only two blocks from the main thoroughfare where there were a number of restaurants and the Cuban culture tends to eat out quite late so these were all open at 8:30. After a quick re-pack of our bags putting all our valuables into the safes provided in our room, we headed out with just enough money for dinner to start our exploration of Havana streets. The side streets all seemed to be under repair as we made our way to the restaurant area. 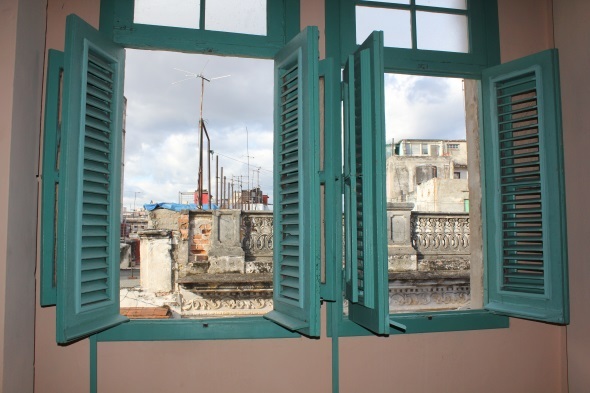 There were enormous holes dug up everywhere with pipes exposed and a strong gas smell in places and you could hear the distinctive beat of the Cuban music pounding out from rooftops, open windows and bars. On the main street, every restaurant had employees out trying to entice in customers as they passed by. We went to one of the first that offered a set menu, which included lobster, rice and vegetables, dessert, coffee and a cocktail to start – all of this for 10CUC (approx. AU$10). This was such a good deal, so we decided to eat there and two of us had lobster, while the kids had chicken and pizza. Whilst the food was not sensational, you could not fault the great value and the lobster was pretty darn tasty! With full bellies, we returned to the Casa ready to rest up before our day of exploring Havana. That night, Jeff was sorting out the Cuban money he had changed at the airport and he realised looking at the receipt for the English Pounds that the lady at the airport had shortchanged him by 20 Pounds. She had only written 280, not the 300 he had given her on the receipt. He had thought that it was a little short with the total she had said it would convert to, but thought it may have just been a bad exchange rate at the airport and as she was counting it out really fast, he was focused on the total written on the receipt and checking she counted those notes correctly, rather than checking the finer detail. So, we were short around 30 CUC – we will see if she is working at the change booth when we fly out in a few days and see if we can confront her and get our money back. I don’t like our chances, but it is worth a try and at least we may make her think twice about doing this to someone else in the future (I imagine it is probably a very regular occurrence as everyone is trying to make an extra buck here! ).